As the Vino Fino boys had recently conducted a Syrahs of the World tasting, we suggested evaluating wines from West Coast producers. Host Jack Sweitzer shared a wonderful old bottle of Syrah with us to start the evening, a 1983 Jasmin Cte-Rtie. 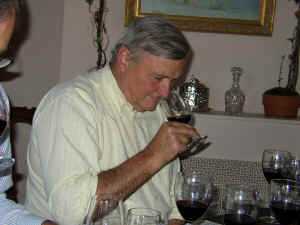 The tasting was most interesting, as we had a lovely range of wines. Virtually every "style" was on display in this flight of wines. A few tasters knocked this one down for having a slightly vegetal note, while others nailed it for showing some SO2. It was the most grapy and fruity wine of the bunch, Mason's showing more like a Beaujolais-styled red amongst more "seriously" intentioned Syrah wines. I found it pleasant and distinctive on the palate...the sort of red that would be enjoyable with chicken or pork. I gave it a one-and-a-half star rating on my three star scale (no stars being ordinary or average). This wine had no flaws, but was simply more quiet or shy compared to the more extroverted wines in this line-up. I found a mild berry fruit note which seemed closed and only showing a bit of alcohol at first. Later it seemed to have a note of mint. The wine is simple, well-made and slightly coarse on the palate (obviously needing some food). Qup makes more "heavy hitter" wines, but this was included to keep the average price per bottle within the realm of reason. Ojai's basic, entry level bottling is really good in its price range. There's a deep quality to the fruit and berry notes on the nose. It may lack a bit of spice, but it's quite a good fragrance. The fruit is bright on the palate, showing lots of berry notes. I rated this one-and-a-half stars. Deep and plummy fruit gives this some interest at the start, then it shows a hint of a woodsy note and, finally, a touch of a bacon character. The wine is quite good on the palate, having a bit of spice and berryish fruit. Two stars. Good value! 4th Place: LUCIA 2001 Santa Lucia Highlands "Garys' Vineyard"
Some tasters didn't care for the rather intense spice notes of this Syrah, but for Jim Sweeny and myself, this was "the" wine of the evening. The wine is extremely spicy and was far more "Syrah-like" than anything else in the line-up. The nose shows notes of white pepper and almost a grapefruit rind spice quality. Very peppery on the palate! Three stars! Of course Chalone is famed for some its more Burgundian-styled wines, so this wine is interesting to see how they handled a Rhne grape. There's a hint of a spice note on the nose, but also a woodsy, vanilla bean sort of character. A touch of anise peeks through at the end. The wine has lots of fruit and is nicely oaked...good balance. Good wine! One-and-a-half stars. 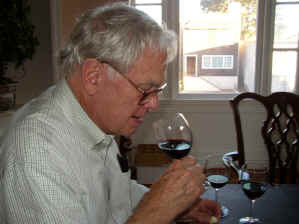 Mister Syrah, Gary Peer, who had the low "delta" of six. Yes, that's Allan Anderson in the background! 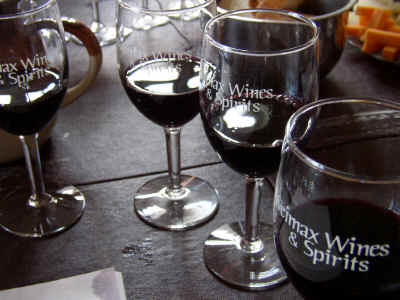 When tasted alongside other Lewis wines, one can taste the "Syrah." 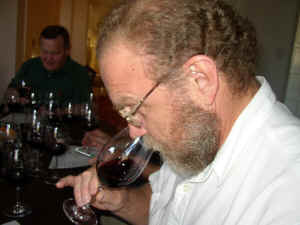 When tasted alongside other Syrah wines, one encounters a huge amount of oak and not much else. The wood, though, is quite pleasant. I couldn't identify this as "Syrah" in this tasting, but as an internationally-styled red wine using a lot of wood, this is certainly going to have its fans! There's more wood than you can shake a stick at on the nose and plenty on the palate. 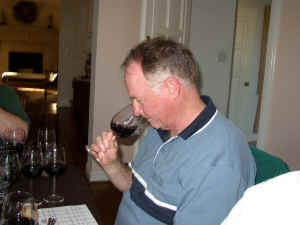 One taster remarked "This is what all red wines should taste like! I love it!!" I gave it a one-and-a-half star rating, more points for style than for varietal character. 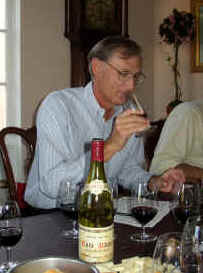 JC is Jeff Cohn, a winemaker at Rosenblum Cellars. 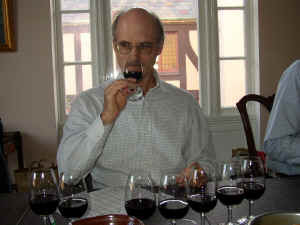 He's quite a fan of Rhne wines and his own bottling from Napa's Caldwell Vineyard is very complex. It's one of those "gobs of fruit" wines, showing floral and berryish notes on the nose, with hints of olives, spices and more! Very juicy and fruity, there seems to be a bit of residual sweetness here, so it's not "bone dry" and particularly grippy on the palate. Nice texture, though. Big. Two-and-a-half stars.